Originating from the Malabar Coast of India, pepper is one of the oldest and most coveted of spices. Referred to in ancient times as “black gold,” it was so prized that it was often used as a currency, particularly in Greece and Rome. During the middle ages, peppercorns replaced money for dowries and rents, hence the term “peppercorn rent” (a nominal fee to rent property, which still exists in modern day legal parlance). These days, good ol’ fashioned black pepper is such a pantry staple that we take “the king” for granted. To help me prove pepper is no yawner, I paid a visit to Andrea Brockie (aka the Salt Queen, who also happens to know a thing or two about the king of spice), owner of Selsi Searocks in Toronto’s renowned St Lawrence Market. Selsi’s wares are the gourmand’s rebuttal to boxed iodized table salt and lifeless ground pepper. Brockie offers an exotic array of salts and peppers from all over the world. Though Indonesia and India are the largest producers of peppercorns, she reveals that those from Vietnam and Cambodia are coming on strong. All “true” peppercorns, be they black, white or green, are offspring of the Piper nigrum pepper vine, Brockie explains, adding that the berries grow in clusters and are harvested at different stages of ripeness and processed differently. Each colour represents a different stage of maturity. Green peppercorns are the first ones to be plucked from the vine. These unripe berries retain their deep green hue. They have a spicy, fresh, bright herbal aroma, and are milder in flavour than their black counterparts. You can eat them whole and still smile! Try them in a green peppercorn steak sauce; add them to a beef Penang curry; use them whole or chopped in soups, potato salad, and pasta sauces. If you ever come across fresh green peppercorns, buy them … and a lottery ticket! Since they are harvested when the berry is still green and unripe, fresh peppercorns are usually only readily available in pepper growing regions. They decay quickly if not dried or preserved, so they are rare and hard to come by. “October is the peak season for fresh green peppercorns,” explains Brockie. It was my lucky day when I received a few clusters from a friend of mine (I also bought a lottery ticket that day). If you aren’t so fortunate to come across them (or lucky enough to have a friend like mine), you can find them air-dried, freeze-dried, as well as nestled in a jar floating in vinegar or salt brine at speciality grocery stores. The ubiquitous black peppercorns are the next to be harvested by the pepper guillotine (that could be in the form of hands or machines — Selsi’s peppers are all harvested by hand). Picked at the midway point of ripeness, black peppercorns have a stronger flavour profile than green ones. Bring left to dry and shrivel results in their trademark black colour. The outer husk imparts citrusy, woody, floral notes. Sniff with caution, or else! Pepper, regardless of the variety, contains a chemical called piperine, which gives the berry its distinctive spicy flavour. And the same thing that makes the pepper spicy to the tongue makes it irritating to the nose. Black peppercorns are available whole, cracked, or in pre-ground form. The smell and taste of pre-ground pepper fades quickly so, much like coffee, it’s best to purchase whole peppercorns. When you’re ready to use them, grind, crush them by hand or even with the bottom of a heavy pan. For an unconventional way of using pepper, try grinding freshly cracked pepper on strawberries and see how it enhances the flavour of the berry. Ho-hum to yum-yum in a flash! But my ultimate use of black pepper? I reunite black pepper with his loyal companion, sea salt, and good quality dark chocolate. The fruity pepper and the enhancing crunch of the salt add to the chocolate for a gastronomic trifecta! And, believe it or not, vanilla ice cream topped with cracked black pepper and a splash of peaty scotch (like Ardbeg) is also a unique palate-zapper! White peppercorns are fully mature berries (which are actually red or pinkish in colour) that have been soaked so the outer skin and flesh are removed to reveal the inner white seed. They lack the aroma of black pepper, but they have an intense, powerful flavour, with a slightly earthy taste and smell from the soaking process. They can be found in whole or pre-ground form. While black pepper is more popular in North American kitchens, white pepper is commonly used in European cooking for aesthetic reasons. Blame it on the French (or Julia Child). She wasn’t a fan of seeing black pepper flecks in white sauces. The white pepper is also used in many Asian cuisines for its specific flavour. Recognized for its sharp bite, it is used to boost extra flavour in aromatic Vietnamese soups (pho), Thai meat marinades, spicy stir-fry, and Chinese soups. Whenever I feel like I am coming down with the flu, I pay a visit to my local Chinese restaurant and order a big bowl of hot and sour soup (aka “clear your sinuses” soup). The distinct pungent heat from the white pepper (the “hot”) clears my sinuses both when I am eating the soup and inhaling the fragrant steam. what do you mean they aren’t peppers? Here’s a revelation: what are sold as “pink peppercorns” and “Sichuan peppercorns” are not true peppers. Don’t let the word “peppercorn” confuse you. Although both the berries resemble peppercorns, they are not part of the Piper nigrum family. To add to the confusion, the term “pink peppercorns” is also used to refer to the ripened berries of the true pepper vine. “Pink peppercorns are part of the Schinus bush, they are not true peppercorns. They are low-lying bushes that originated from South America,” clarifies Brockie. When dried, these rose-hued berries have a thin, fragile skin and have a pine-like flavour, resembling juniper berries with a lemony essence. As Brockie further explains, “traditionally, they are used in salads, desserts, and with foie gras dishes where you don’t want the heat but you want the pepper taste.” However, those with tree nut allergies should err on the side of caution; these innocent-looking berries are members of the cashew family (Anacardiaceae) and can cause the same serious, life threatening allergic reactions. Not only used in food, pink peppercorns have been showing up in craft beers around the world, primarily lambic and saison styles. When added in small quantities, along with other herbs and spices during the brewing process, the beer takes on a fruity quality resembling golden raisins, plums, and/or juniper berries. These jewels were so tasty that I was snacking on them whole while sipping on a Double Imperial Ale from a local microbrewery. The sweet and citrus flavours of the peppercorn surprisingly (in a good way) complimented the tropical fruits, blueberry and cedar aromatics of the beer. Sichuan pepper is another “pepper that isn’t.” An aromatic berry related to the prickly ash shrub, its rust-coloured husk splits to reveal a tiny black seed. It has a unique aroma and flavour that isn’t hot like other peppers. “Sichuan peppers are not hot at all, however they become hot and spicy when mixed with chilli,” explains Brockie. Native to the Sichuan province of China, they are known as hua jiao, or “flower peppers.” In the ground form, Sichuan pepper is one of the ingredients for five-spice powder. The “peppercorn” has a faint lemony note and creates a slight, almost electric, buzzing numbness in the mouth that people can easily confuse as heat. Sichuan peppers are found as whole, split berries and require a little bit of prep work before using them. “The black seeds between the berries should be removed, they taste horrible and gritty,” Brockie winces. “Dry roasting them really brings out the fragrance and changes the texture so that they aren’t too chewy.” Don’t let the prep work discourage you. Trust me, you will be rewarded for your efforts when you use them as a spice rub prior to roasting rich and fatty foods like duck or even as a condiment when mixed with salt to form a dip for crispy, deep-fried chicken wings. The tingling electrifying buzz that envelops your lips and tongue is truly addictive! When purchasing any type of peppercorn, Brockie says to look for “whole uniform peppercorns with no twigs. Ground pepper loses half its flavour within one hour of grinding. Freshness is based on when you grind.” Dried whole peppercorns kept in a tightly sealed container in a cool, dark and dry place will keep almost indefinitely, while ground pepper will stay fresh for only about three months. And finally, pepper is full of beneficial antioxidants; a little pepper can be a big boost for your health. A dash here to calm a cold, a sprinkle there to detox your skin, a pinch there to help in digestion. Pepper is hot stuff in more ways than one! In any case, forgo the old grind (of pre-ground pepper). Epicureans around the world may still be swooning over Himalayan pink salt and fleur de sel, but I think it’s time to shake the salt habit! Turn the spotlight on Balinese long pepper, comet tail, and grains of paradise and shake up the pepper mill. With a box of tissues on hand for a possible sneezing session, I ground each peppercorn with a mortar and pestle and sampled for flavour and aroma. All of these exotic peppercorns can be found speciality spice stores. Like other regionally protected products, peppercorns can only be called Tellicherry if they are from a specified region on the Malabar Coast of India. The Tellicherry is one of the finest peppercorns in the world. It has a full, robust flavour and fruity bright freshness. Very balanced and makes a great all-purpose pepper in your kitchen. Although Vietnam and most other Asian countries predominantly use white pepper in their cuisines, Vietnam is the world’s greatest exporter of black pepper, as a result of its favourable climate conditions and the traditional cultivation of the berry. When cracked, the berries released a hint of citrus fragrance, and even some fennel aromas. The taste profile of these berries evoked smoke, black tea, and wood, which would perfectly complement any duck or game dish. I should have been forewarned by the word “hot” printed on the package. There was an intense heat right away that left a long, lingering, spicy finish. Perfect for those seeking a pepper kick! Indigenous to Sri Lanka, this black pepper was the most powerful spice before spicy peppers arrived on this island during the colonial days. Compared with the Vietnamese black peppercorns, the shape of the berries is more uniform. This pepper is fruitier and has a subtle heat that builds over time, as compared to the direct heat that I got from its Vietnamese counterpart. In ode to the history of this pepper, the next time you make a curry, replace the spicy chilli peppers with Sri Lankan black pepper. Black pepper curries are the original flavours of the island’s pre-colonial days. The rounded warmth you get from the pepper will be much more subtle than the chilli pepper. The taller cousin to black peppercorn, the long pepper was once prized by the ancient Romans. This pepper is used traditionally in Indian (India also grows long pepper), Indonesian and Malaysian cuisines. Grown in the mountainous central highlands of Bali, this pepper is making a comeback in the culinary spotlight. This long pepper looks like a tiny pinecone and is Brockie’s favourite. “It is the most interesting one out of the bunch,” she admits. “Use it as you would where a recipe calls for black pepper. You need to respect it, as a little goes a long way.” Indeed a little does go a long way. Much like a chilli pepper, the tiny seeds in this pepper are what give off the heat. Brockie warns, “Don’t grind the seeds; the seed is where the heat is. There is not a flash heat once in your mouth, but the heat slowly builds over time and stays in your throat.” Long peppers can be crushed in the mortar and pestle, in the pepper grinder or even simply by snapping the pepper in half. Once crushed, the pepper released an earthy pungent heat and a sweet blend of cardamom, cinnamon and nutmeg — the garam masala of peppers. This pepper is like a hybrid of black pepper and chillies, add it to recipes where you want considerable complexity and flavourful heat. Also known as tailed peppercorn, comet tails look similar to black peppercorns but have their stems attached, resembling small pushpins. They are hollow and smell very similar to allspice. They have a unique flavour that is very fragrant (lavender), astringent and leaves a slight bitterness that lingers in your palette. “This is a very traditional spice used in Bali. The Balinese eat the crushed peppers on top of a bowl of steamed rice,” Brockie reveals. The Indonesians also claim that the peppercorn is an aphrodisiac. For an easy to prep date night, perhaps a bowl of steamed rice sprinkled with a few crushed comet tails? 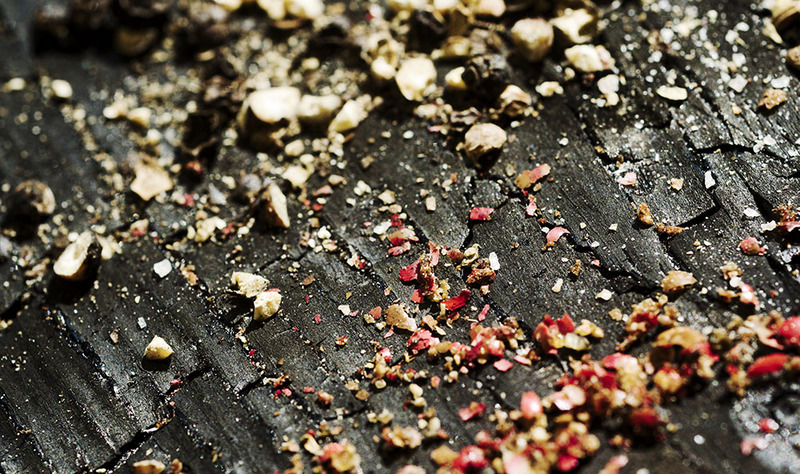 The beautiful marriage of east and west — Sichuan pepper and salt. Traditionally, the Chinese use this mixture to cut the rich oiliness of deep-fried foods. Perfect as a dipping salt for deep-fried chicken wings or as a spice rub for roasted duck. Remove the black seeds. Discard any twigs or thorns found in the peppercorns. In a wok or skillet, roast the peppercorns and salt on low medium heat. Constantly shake skillet, or turn mixture until fragrant (about 3 to 5 minutes). The salt should take on the same colour as the peppercorns (beige). Let mixture cool. Grind mixture with mortar and pestle or an electric grinder. Sift through a fine sieve and discard any husks. Store in an airtight container for up to 3 months. If pink peppercorns can be used to brew beer (and be snacked on), why not add a few of these pretty-looking berries to your G&T at your next cocktail party? The pink peppercorns will highlight the background aromatics of juniper found in gin. Impress your guests and transform the humble drink into a gourmet experience. In a mixing glass filled with ice, combine ingredients and stir for 1 minute. Strain into an Old Fashioned or Rocks glass over a large ice ball or cube. Garnish with an orange zest. In a large pot, combine together 500 ml water, 300 ml maple syrup and 200 g coarse brown sugar over low heat. Stir until all the maple syrup and sugar has dissolved. Add in 20 pink peppercorns, 3 star anise, 3 green cardamom pods, 2 vanilla beans (split), 4 cinnamon sticks, 8 cloves, 2 nutmeg (split), 10 allspice and 2 full orange peels. Let simmer for approximately 15 minutes then remove from heat. Once chilled, strain into 2 750mL bottles. Makes approximately 1 litre of spiced simple syrup. Stirred together in a shaker, strained into glass, dusted with black pepper. Bring 2 cups of water to a boil. Add the following and let simmer on low for 10 minutes: 1 vanilla bean, halved; handful (maybe 1 oz shot glass worth?) of whole black peppercorn, and the same of ground pepper; pinch of clove, all spice and star anise. Put in sealable container and store overnight at room temperature. Strain through cheesecloth or coffee filter. Bring peppered vanilla water back to boil, remove from heat and stir in 2 cups raw sugar, gradually to taste. Pepper bitters: add 1 oz of black peppercorn to 375 ml bottle of Angostura and let sit for 2 weeks. Strain away and rebottle. The pan sauce made with the king of spice is so deliciously rich it’s fit for a king! If possible use fresh green peppercorn, it is sublime. Heat heavy pan over medium high heat. Season steak with salt and pepper. Add oil to the pan, once the pan is hot enough (you will see the oil shimmer), add steaks to the pan and cook to your desired doneness. Transfer steak to a plate. In the same pan, reduce heat to medium, add a little oil to the pan, add the shallot and cook until softened. Deglaze the pan with the brandy, scrape the bottom of the pan and all the deliciousness with a wooden spoon. Let it reduce by half. Add the stock and the peppercorns to the pan. Bring to a boil. Stir in the cream, season with salt and pepper if necessary. Once the sauce has slightly thickened, turn off heat. Drizzle the sauce on the steak.